Olivia is so funny. She is always making me laugh and keeps me busy. One thing that she says lately, that I randomly hear her say is "anta, HO! HO! HO!" (anta is Santa) Christmas must be on her mind a lot because we hear it all the time! Among many other things that she loves to do is dress herself, which results in a room covered in clothes, until she finds just the right outfit for her. 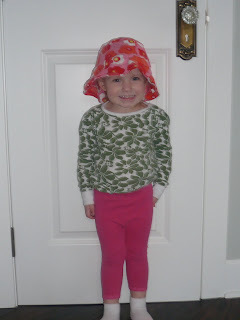 Here is one of her "getting dressed all by herself" outfits looks like. 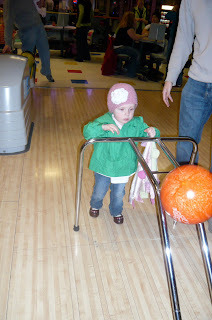 We also took her bowling for the first time. She loved it! I think she even bowled a better score than me! And that hat she is wearing, that is my latest project. 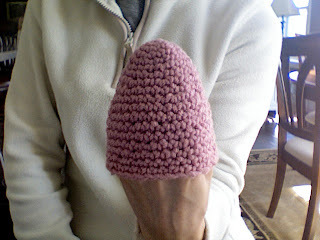 I learned how to crochet and thought, I might as well do a hat! I was really easy, and she wears it all the time. I am not sure if she is just trying to make me feel better or what, I am just glad that it fits. I am glad you didn't expound...it sounded semi naughty. Geeze, Heather! We should have taken pics of all of us bowling, that would have been fun! She is so cute - love the dressing yourself. CJ has started wanting to wear his pj's all day. And I love the hat - you will have to teach me for #2 coming! We all know where Olivia gets her fashion sense from.... Apple doesn't fall far from the tree. And its a good thing Chris doesn't read the blog... Bah-ha. 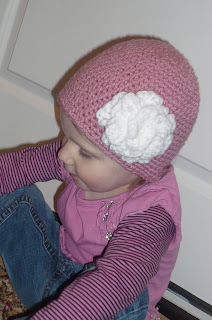 The hat turned out adorable, Heather! You weren't suppose to learn without me :) - but as long as you teach me all these cool things you're learning, I'll forgive you :)! And I love the anta, ho ho ho story - too funny! Walker did you crochet the flower too? I LOVE IT!! Please will you teach me? I want to make a hat for William so bad. When are we getting together again?